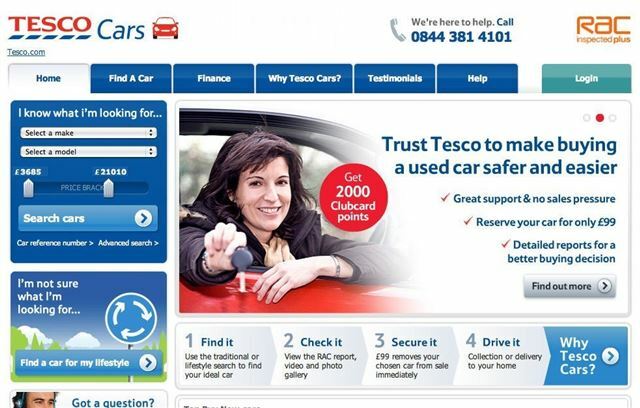 Supermarket chain Tesco has been forced to close its online used car venture, Tesco Cars, after just 12 months. The business was set up in partnership with Carsite but struggled to sell enough vehicles to be viable. With Tesco profits falling, the firm has decided to cut its losses and close the site. Tesco Cars was was launched last April and promised 'to make the whole used car buying experience easier, safer, more transparent and more enjoyable'. It delivered vehicles direct to customers homes for a fixed charge of £149 and also offered 2000 Clubcard points. The site claimed to advertise up to 3,000 cars every week with fresh stock added daily. Its range of cars, between six months and three-years-old, included MPVs, small hatchbacks and executive saloons. Servicing came from a nationwide network of more than 1,000 independent garages operating through an arrangement with National Service Network. However, sources claim that the site was only selling 150 cars a month and began laying off staff over Christmas. Tesco Cars apparently had problems sourcing popular models, which would explain the poor sales numbers but with no improvement on the horizon the site has been closed and is no longer accepting orders. Visitors to to the Tesco Cars website are now greeted by the simple statement below along with information for customers who have placed orders. The firm is offering a full refund of the £99 handling fee, or alternatively if the vehicle is in stock it can proceed with order. Customers who have already paid for their vehicles will still receive them. Any warranty is still valid as these are provided by Warranty Group, which will continue to honour all warranties. Tesco Cars isn't the first high profile online car retailer to fail. Jam Jar cars was launched amid much publicity in 2000. A joint venture between RBS and dealer group Dixon Motors, it was the first major online car retailer, but closed in 2009 after Dixon Motors went into administration.